In my 37 years of traveling, I’ve spent a lot of time sitting in an airplane chair in very uncomfortable outfits. Thankfully, those days are long behind me & I have finally figured out what I like to wear to and from my destination. But before I get into my outfit of choice, let’s discuss one of my main concerns about airport style (and sadly, one that I feel like still isn’t understood by many): Pajamas are not acceptable in an airport. You are in public. You are not in the comfort of your own home. You are a paying customer in a place of business. (And people wonder why they don’t get good customer service from airline employees? Well, for starters, YOU ARE IN YOUR F*CKING PAJAMAS. If you want to be treated like a respectable adult, DRESS LIKE ONE.) I DON’T CARE IF YOUR FLIGHT IS AT 6AM & YOU PLAN ON GOING BACK TO SLEEP. Leggings and an oversized sweater is just as cozy than pajamas and way more chic. 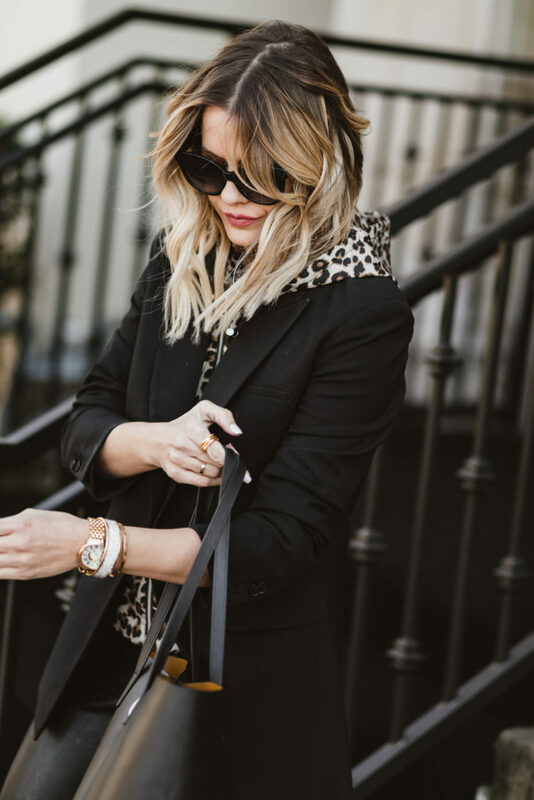 Veronica Beard Blazer with Dickey: If you are unfamiliar, go ahead and familiarize yourself IN THIS BLOG POST HERE about my deep love affair with this investment piece. If I am traveling for work, its always on my packing list, and in order to make more space in my suitcase, I wear it on the plane. The blazer looks chic and the hoodie dickey underneath adds a super cool, interesting element! Leggings of some sort: I really try to avoid jeans at all cost when I am on an airplane for 2 reasons: 1) They are terribly uncomfortable to sit in, & 2) They will stretch out and look like saggy bottom jeans after sitting for 3 hours. 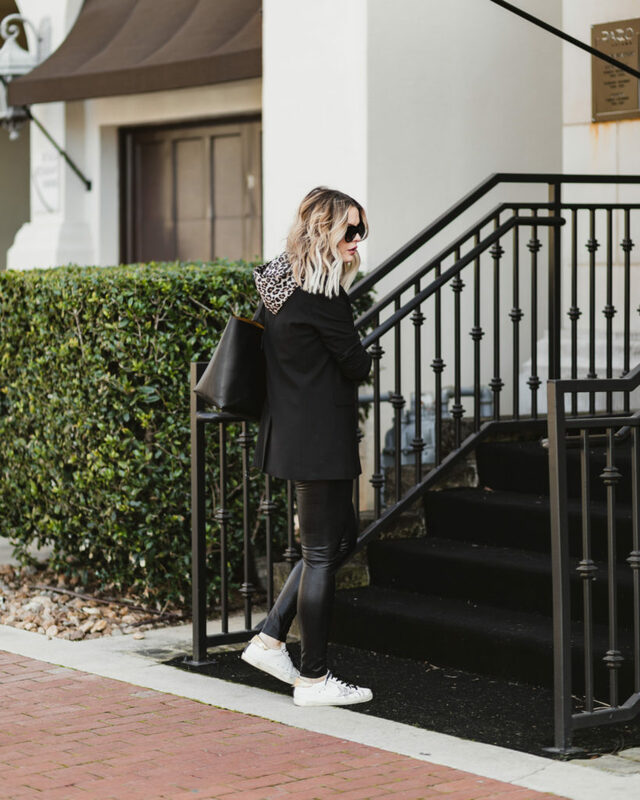 Golden Goose sneakers or a cute flat: Like my blazer, GG sneakers are a must have for me, and since they are a larger item, it makes sense to wear them! Plus, they always score so many compliments and are totally comfy when it comes to trekking through airports with luggage in tow! Tote that goes over the shoulder: I’ve made the mistake of schlepping a tote that wont fit over my shoulder & I WILL NEVER DO THAT AGAIN. 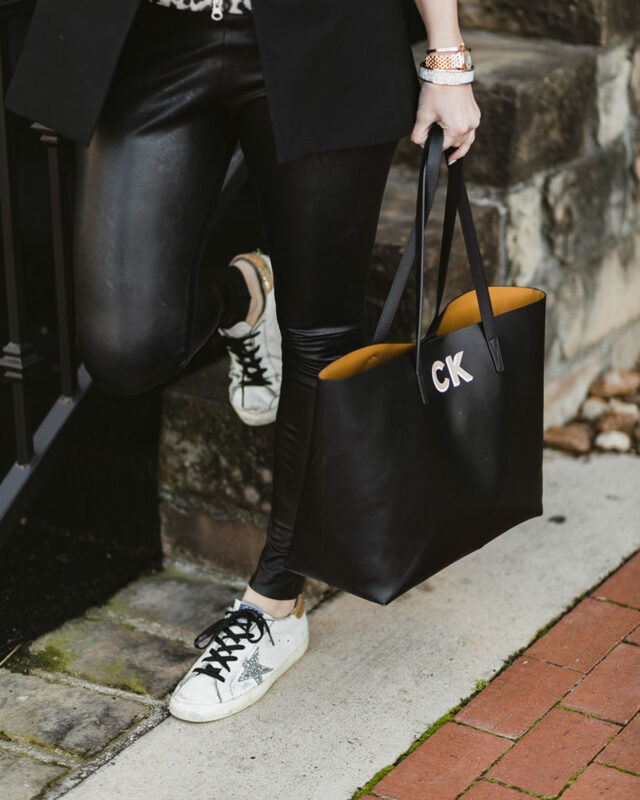 The thing I like about this Leatherology tote is that I can set it on top of my carry-on suitcase when rolling through the terminal and it’s easy to have access to my laptop, travel essentials (I’ve talked about those items in THIS YOUTUBE VIDEO), and I can also fit my crossbody clutch inside, too! 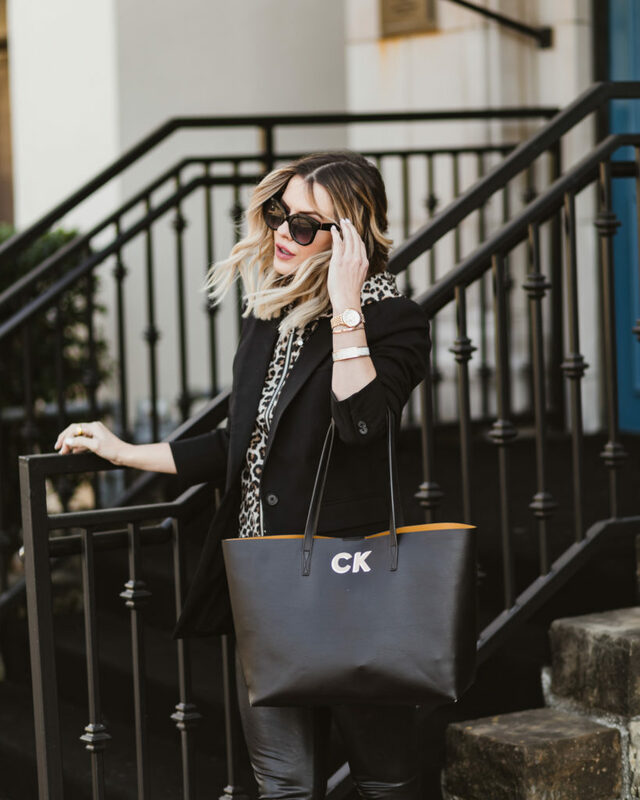 So now that I have shared my ultimate travel uniform, I am eager to know….WHAT’S YOURS?! Share your travel outfit ideas in the comments below! Omg AMEN about the pajamas. Your torquoise ring..? Where can I purchase? My must travel piece is my jean jacket. It goes with everything and can be tied around my waist or stuffed in a carry on bag. where is your hoodie from?? where is your hoodie from?